TEi Limited have been recognised by SafeContractor, a national client accreditation scheme for contractor approvals. This allows the company to tender for work with national clients and shows that the management of health and safety is maintained to the highest standard. 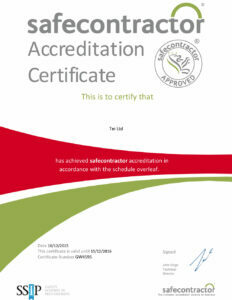 Congratulations to Peter Barbrook and the team that successfully completed the qualification process.